The HD-2700 is a 80-200 kV field emisison gun scanning transmission electron microscope (STEM) with seconday electron (SE) imaging capability. Bulk and surface structures of specimen can be imaged simultaneously. With the option for probe-forming aberration corrector, ultra-high resolution can be achieved for both STEM and SE imaging. The Hitachi corrector minimizes the user's effort in doing aberration correction. Large solid angle EDS and atomic spatial resolution EDS and EELS spectrum imaging are enabled. The incomparable HD-2700 dedicated STEM features the Hitachi developed spherical aberration correction system affording unmatched resolution and analytical sensitivity. By correcting the spherical aberration, resolution of less than 0.1 nm can be achieved in dark-field STEM mode. The HD-2700 is ideally suited for R&D and QC applications in materials science, semiconductors and nanotechnology. Increased (10x) probe current of the HD-2700 enables high-speed, high-sensitivity EDX analysis (solid angle greater than 0.3sr). This allows extremely rapid acquisition of elemental distribution images even for elements at low concentrations. 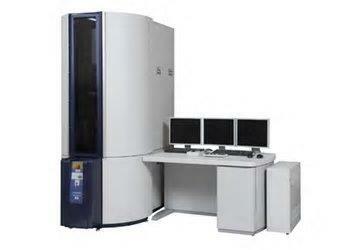 The HD-2700 column is compatible with Dual EDX detectors for ultra high sensitivity EDX analysis. Electron Energy Loss Spectrometry is also available for analysis of light elements with enhanced spatial resolution. Extremely versatile imaging allows simultaneous multiple-image acquisition and display with a wide variety of combinations including SE/BF, SE/DF, BF/DF, DF/EDX and DF/EELS. The HD-2700 employs the same simplicity of operation as the Hitachi HD-series, and the holders are compatible with the Hitachi FB and NB (Focused Ion Beam) systems ensuring seamless operation and exchange between instruments. Seamless solution from sample preparation to observation & analysis. • Simultaneous acquisition & display of SE&BF, SE&DF, BF&DF, DF/EDX mapping(*) and DF/EELS mapping(*) images.